This page will cover the following keywords : E/R diagram, E/R schema, entities, their attributes, entity sets, keys, ISA hierarchies, overlap constraints, covering constraints (specialization, generalization), relationships, relationship sets, key-constraints (many-to-many, one-to-many, many-to-one, one-to-one), participation constraints (partial / total). You should be able to explain them in your own words at the end of this page. A little confusion might occur between Entity-Relationship schema and relational schema. The relational schema refers to the schema of the relation (in red) discussed in the last post. The relational schema describes the columns in a database table. Hence, a relational schema is NOT a synonym of a semantic schema. The first is a table, the second is a diagram. What are the entities and the operations executed on them? What are the relationships between the entities and the operations describing them? The requirements are often mentioned in plain text. They contain data and their functionality. An example of requirements of a database is a db of courses. The different courses offered during the winter semester are the data. The functionality will be the fact that students can register (class is not full yet), courses get canceled, TA is assigned. Another example of requirements is a database of books. Titles, prices, authors are the data. The fact that a book might be discounted, out of stock or lost is the functionality. entity: an object. It has to be distinguishable: a nurse and a doctor are 2 different entities, even if they are both employees. an entity set : collection of entities (employees in an hospital, all the account entities for a bank). They all have the same attributes (each employee has an id, a salary, number of hours due, etc). attribute : a property/characteristic of an entity or an entity set (employee id). ISA Hierarchies : inheritance for the Entity Relationship Model (presence of subclasses/superclasses). An example of an ISA (is a) hierarchy is a database where we have employees as full time and also as contractual. We say an employee is a hourly employee. Another example is a database of living things. A living thing is a plant, but we also have living things as animals in the db. An animal is a fish, but we also have birds. A bird is a land-bird, but we also have aquatics birds. An aquatic bird is a great-blue-heron. If an entity A is also an entity B, the key is only in B, the superclass. overlap constraint (allowed/disallowed) : is it allowed to have an entity being part of more than one subclass? (example : a full time employee implies that he is paid hourly; a contractual employee usually gets paid with a fixed salary; hence, a full time employee can’t be a contract employee : overlap disallowed). covering constraint (yes/no) : does every employees entity also have to be an hourly employee or a contract employee? Does every hourly employee and contract employee are employees of this organization? (yes). Generalization : a bottom-up design, we extract shared characteristics from 2 or more classes and combine them into a general superclass. An account is a saving account and a checking account. Specialization : a top-down design, we create new subclasses from an existing class. We start with the superclass, we define our subclasses and we find their specific attributes and relationships. Weak entities are entities that can only exist when owned by another one. A ROOM can only exist in a BUILDING. A QUESTION is a strong entity and an ANSWER is a weak entity because the answer needs a question to exist. A relationship is an association between two or more entities. A relationship set is a collection of similar relationships: “increase”, “decrease”, “maintain” are all relationships part of the set “progression”. constraints : multiplicity (key-constraints), participation. ternary relationship type : a relationship involving more than 2 types (a PROFESSOR “recommends” a TEXTBOOK on a certain COURSE, we have a relationship connecting 3 types). A relationship type also has a multiplicity constraint (key constraint), which is the maximum and the minimum elements allowed in the set. 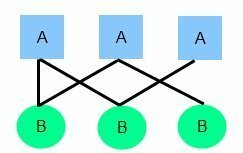 one-to-many multiplicity: one entity of A is related by R to many entities of B AND one B is related (by R’s inverse) to one entity A. R will be called “one to many”. In the same time, many entities (in our case of type B) are related to one entity (in our case of type A). We call this many-to-one and we depict it with an arrow from the element that’s not unique (in our case of type B) to the element that’s unique (in our case of type A). many-to-many: one entity A is related by R to many entities B AND B is related to many entities A.
one-to-one : one entity A is related by R to one entity B. We depict it with an arrow from both elements. Another constraint that relationships have are participation constraints. The participation can be total or partial. An example of total participation is the fact that every department has a manager. This is represented by a thick line. An example of partial participation is the fact that not every employee is a manager. capture as many constraints as possible.